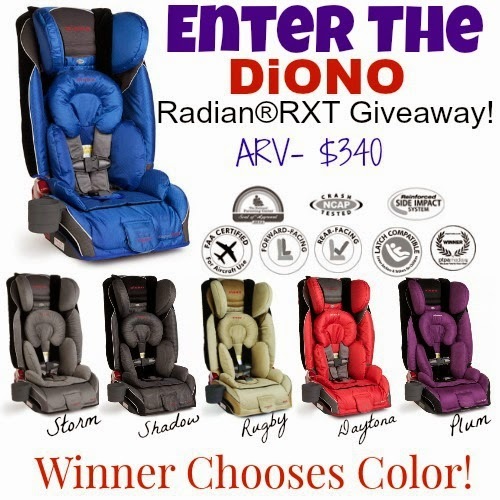 "The Diono Radian®RXT Carseat is an amazing addition to any family who loves to travel. The installation is so very easy, and the comfort of the memory foam will help to keep your little bundle of joy comfy and safe. Diono offers a wonderful selection of convertible car seats as well as booster seats, all of which offer "Safety in Style"." To read the the full review on the Diono Radian®RXT Carseat by StellarManicMommy2, you can read it HERE. This car seat is easy to fold to make moving it easier. You are also able to add travel straps so that you can take it with you on a flight for your next vacation, business trip, or conference. The Radian is also an FAA approved car seat. Disclosure: Nanny to Mommy received nothing to share this giveaway. This is a sponsored post on behalf of Diono & StellarManicMommy2. The participating bloggers are not responsible for prize fulfillment. One winner will be randomly selected using the Giveaway Tools random selector and notified via email by the hosts of this giveaway, StellarManicMommy2 & Diono. Once notified, the winner will have 48 hours to respond or a new winner will be chosen. This giveaway is in no way associated with Facebook, Twitter, Instagram, Youtube, Pinterest or Google. Void where prohibited. Open to entrants of U.S. and Canada. My little girl would love a plum seat! I would choose plum for my little girl! I would probably choose Rugby or Storm. These are so cool, wish i'd of seen this in time! every color is vibrant and nice, but I'll go with blue.... thx! I would choose the Shadow seat, easier to hide messes! I would pick shadow. I love the rich dark color. I would choose plum. Love it! I think I'd go with cobalt! I would choose storm! Thanks for the chance to win!